In this week’s luxury property blog, we highlight three exclusive, high-end villas for sale on the prestigious Golden Mile in Marbella. In this article, we share three exclusive villas in this privileged area. 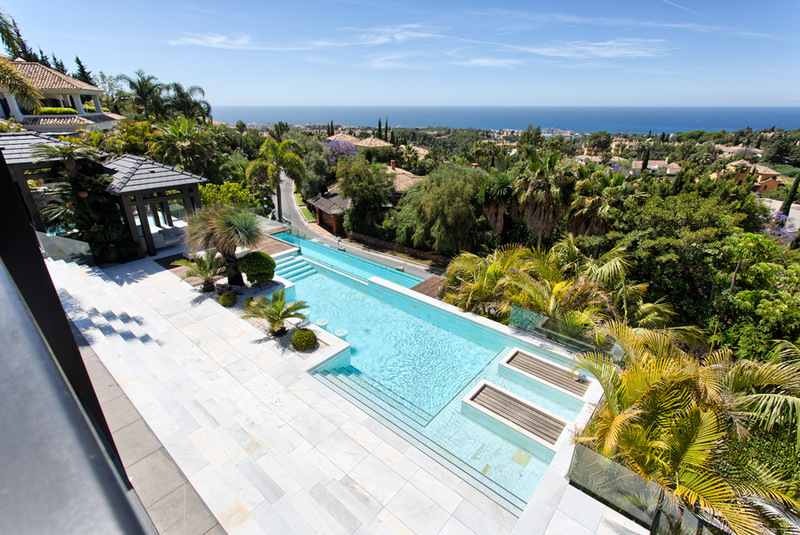 Exclusive real estate in the area of Marbella is considered stable, and a good investment. Moreover, Marbella is often seen internationally as a ‘safe haven’, just like Switzerland and Monaco. This will continue to attract wealthy buyers who enjoy a luxury lifestyle. Marbella and its famous Golden Mile is the ideal place for ‘city people’ who love crowds and enjoy all amenities within walking distance. Marbella has plenty of nice shops, excellent restaurants, cafes, a typical fishing port and even a small marina. Moreover, art and culture are never far away. Did you know that in Marbella is the home of 10 authentic Dalí statues that can be found at the Alameda park, located between the old city centre and the beach? Time to highlight this top 3 of Luxury villas on the Golden Mile. This is exclusivity at its prime. Luxury meets location. This exceptional villa is constructed over three levels. The private lift brings you to four master bedroom en-suites and studio on the upper floor, all with mesmerising sea views. Continuing the tour we really get that Hollywood/LA vibe. The impressive lounge and dining room with an impressive floor-to-ceiling glass elevator allows the eye to flow seamlessly from the welcoming reception room and lounge through to the merging marble lined infinity pool with the Marbella coastline. Designed by Joaquín Torres, Spain’s leading designer of luxury villas for celebrities as Penelope Cruz, Javier Bardem and Ronaldo. This villa tops the list of luxurious properties in Marbella. It is situated in the foothills just behind Marbella, offering just magnificent sea and mountain views. The villa is built on a dazzling 8600 m² plot with nearly two acres of landscaped gardens. The villa has a peaceful, semi-rural ambience, and ideally located…only 5 minutes from the vibrant center of Marbella. Built in 2010 to the most demanding of standards, this contemporary villa features the space and amenities more usually associated with a luxury hotel rather than a private residence. Use to button above the image to take a closer look. The Golden Mile is one of the most sought-after residential areas of Marbella. It is home to many luxury plots and villas. Also quality, modern design villas are represented. This amazing mansion with sea views if one of them! It is located in a very quiet and private community with 24-hour security, and still close to Marbella town and the beach. The villa breathes luxury directly from its entrance. A driveway leads to the main entrance of the house. A grand hallway brings to the living and dining area and the fully fitted open plan kitchen. Direct access to the covered and open terraces, bbq and pool area with 3 different style pools (heated) all fit for outside living and relaxing. Upstairs a huge master bedroom en suite with dressing area, fitness and salon/bar and one guest bedroom en suite. Cilo Marbella is an exclusive boutique agency specialising in the sales and rental of luxury residential properties in the Marbella area. We offer a broad portfolio of luxury rental villas and exclusive villas for sale in Marbella and surrounding areas. Please feel free to let us know what your requirements are and we look forward to meeting with you in person on your next visit to Marbella.